Rabbit books are an excellent way to gain knowledge prior to starting with any form of rabbit hobby or business. Far too many people get into rabbits thinking it will be easy, and/or quick money, only to learn the hard way that there's more to it than meets the eye. Whenever someone is considering getting into rabbits for any reason, we strongly encourage them to read up on these wonderful animals first, so that the new owners know exactly what to expect, how to manage their animals, how to optimize their production goals, and most of all, how to enjoy the whole process. But which rabbit books are the best, and which are most suitable for each particular goal? Commercial Rabbitry Management – books which are intended for folks interested in relatively large numbers of rabbits (25 or more), and need information relevant to maintaining those larger populations. Meat Rabbit Production – books suitable for any scale of meat rabbit production, whether for the family, direct sales to the community, or retail/wholesale sales to a larger buying group. Fiber Rabbit Production – books suitable for any scale of fiber rabbit production. Some books will focus more on managing the animals, while other books will focus more on harvesting and using the fiber. Most books provide at least some information on both. Pastured Rabbit Management – To our knowledge, there is not yet a book devoted entirely to the topic of keeping rabbits on pasture. Nevertheless, a few books have discussed it enough to be valuable to someone interested in this management technique. Rabbit Business Issues – Many people get into rabbits thinking they'll get rich quick. And 12-18 months later, they get back out again when they realize it doesn't work quite that easily. Rabbits can be profitable livestock, but not without a solid commitment to managing them like a business. These books provide information about how to do exactly that. Pet Rabbits – While not as popular as dogs and cats, rabbits are gaining popularity as pets. Several excellent books have been released to provide information on just this aspect of rabbit ownership. Wild Rabbit Biology and Behavior – Rabbits are still very closely related to their wild cousins, in both biological requirements and behavioral traits. These books discuss wild rabbit populations, which any astute domestic rabbit owner can use to improve his/her rabbit herd management. If you have a favorite rabbit book which isn't listed here, please Contact Us and let us know so that we can add it to the list. This is one of the best all-around introduction rabbit books we've yet found. It covers feed, housing, reproduction, and some of the more common diseases. It is not very imaginative in terms of housing or diet, instead taking the conventional tack of single-occupancy cages and standard commercial pellets. But it covers all the bases for new owners, and answers many questions about the details of how to get started well with rabbits. This is the official how-to-get-started rabbit book from the American Rabbit Breeders Association. Like the book above, it contains information about feeding, housing, reproduction and healthcare. But it also provides information about different rabbit breeds, which is valuable regardless of your goals. Solid information from the national rabbit breeders group. This is a long-running classic in commercial rabbit production. The information here has been gathered by both professional and academic rabbit production personnel, after raising thousands of animals. The strengths of this particular rabbit book, in any edition, is the tremendous amount of experience contained within its pages. No one person has the combined experience of these authors. Another big advantage is their experience with commercial-scale production. For those folks who want to raise rabbits on a larger scale, these authors have experience solving issues that only come up with larger-scale operations. However, this book does have some shortcomings. The same commercial-scale experience means that these authors did not stray far from the conventional road, and their solutions reflect that. After we had gained a certain amount of experience with our rabbit herd, we were able to tell when their advice applied to us, and when it didn't. But overall, there is no single rabbit book which better illustrates efficient, conventional management of medium and large scale rabbit operations. I found this book in a beloved used book store, and quickly realized how priceless it was. This is one of the few rabbit books I've ever found which carefully details wild rabbit society. While that might not seem particularly important, it was valuable information when we decided we wanted to explore alternatives to the standard single-occupancy cage and pellet diet. Rabbits are ancient creatures, with well established instincts and behavioral repertoires. This animal behavior assessment gave us great insight into providing our domesticated rabbits with more humane housing, more appropriate diet and a better overall quality of life. Plus, it's a good read from a very pleasant British author. If you've ever wondered what wild rabbit society is like, and how to manage your rabbits according to their needs as well as your own, this book will help you. This is another rabbit book which isn't usually found on the hobbyist shelf, but it very much deserves a place there. 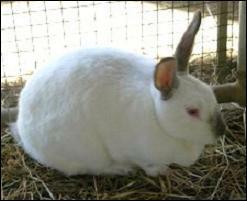 When rabbits are kept as pets, rather than as livestock, their individual concerns are more often considered and provided. Even when rabbits are kept as livestock, the lessons learned from pet rabbit management can be invaluable. This book was written by authors associated with the House Rabbit Society, an organization which not only promotes rabbits as pets, but also provides rescue and rehoming services for domesticated rabbits. The book contains more information on varied diets, comfortable housing, behavioral management and proactive training than any other rabbit book I've ever read. If you want to treat your rabbits like living breathing feeling creatures, rather than objects, this is a good source of information. You don't have to let them sleep on the couch to provide your rabbits with a few creature comforts. Very highly recommended. As the name implies, this book is dedicated to those folks who want to bring a rabbit or two into their household as a pet. It is a general purpose guide to managing rabbits indoors, which includes topics such as litter-box training, socialization, integration with other pets, etc. This book isn't yet in our collection, because we have not yet ventured into the realm of raising rabbits for fiber production. If we ever get that far, this book will be where we start. Very good reviews on Amazon.com and generally ranked as the top book on fiber rabbit topics. The book includes sections for managing the rabbits, and managing the fiber, whether for hobbyist or commercial production. Given the title, I would also expect it to be geared towards readers who are new to rabbits in general. I look forward to adding this book to our collection someday. This book was pivotal for us for many reasons. In general, it gave us the encouragement we needed to start our own farm. Joel Salatin is very well respected as one of the driving forces behind renewed interest in American small-scale, family-friendly farming and ranching. But more importantly, this book is one of the very few places I've ever seen pastured rabbit production discussed in detail. Joel's son David began raising rabbits on pasture for meat production, and has made quite a reputation for selling top-quality rabbit meats to selective restaurants in the mid-Atlantic region. All with the same basic tools that his dad uses for pastured poultry production. This book discusses pastured rabbit production in enough detail, that folks can get a good introduction to that management approach.